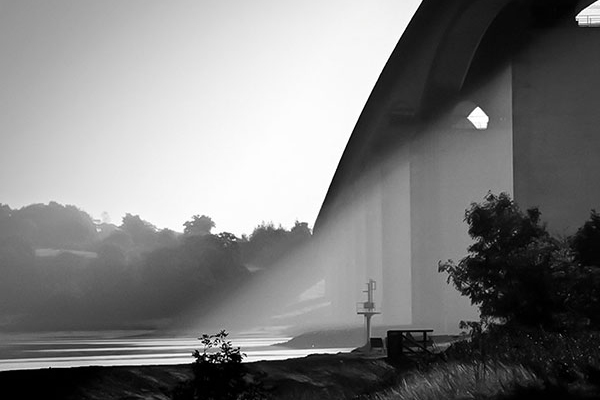 The Orwell Bridge in architectural photography has been captured many times. Construction finished in 1982 and there always seems to be an image in the local news, on Facebook or Twitter where someone has posted a picture either professionally as artists or as they go past it, there always seems to be a new angle to show off its grand design and architectural genius. I’m never bored discovering ways it has been captured by different artists. Driving over and under it makes many a car seemingly slow as the passengers inside marvel at it’s size and strength. The Orwell Bridge has an elegance and simplicity which I can only describe as beautiful. Despite being made from dull grey concrete and being a hard structure this bridge feels gentle to me, it flows, it is majestic and from a distance it hides it’s incredible size until it is put into perspective i.e. as I did with the worker and digger photographed underneath. I love architecture and follow many who appreciate the art of architectural photography. I find the brilliance of engineering mixed with functionality and creativity inspiring and find myself looking forward to commercial photography projects where my subject to photograph is a building, either interior or exterior or perhaps both for a commercial website or brochure. Some may call me bonkers but that is how it is! It got me wondering what is it that makes us as artists (in whatever medium we chose) inspired to capture something.